A few weeks ago the hubs and I took a day trip to check out various Loveworks in Virginia. I had no idea that these art installations existed all throughout the state and we hit the road to visit 3 of them. That was the plan at least, until we found out after arriving in Richmond, that the one at VIR was only on display 2 weekends last year. The one pictured below is located in Culpeper and is made from film reels mostly donated from the U.S. Library of Congress. Since things didn't go as planned in Richmond, we spent some time driving around downtown and checking out some of the artwork from the 2013 Richmond Mural Project, which was curated by Art Whino. When I found out that there were pandas, I had to go see them. One was already painted over, but this guy was still showing plenty of attitude, painted by Adam "Woes" Martin. 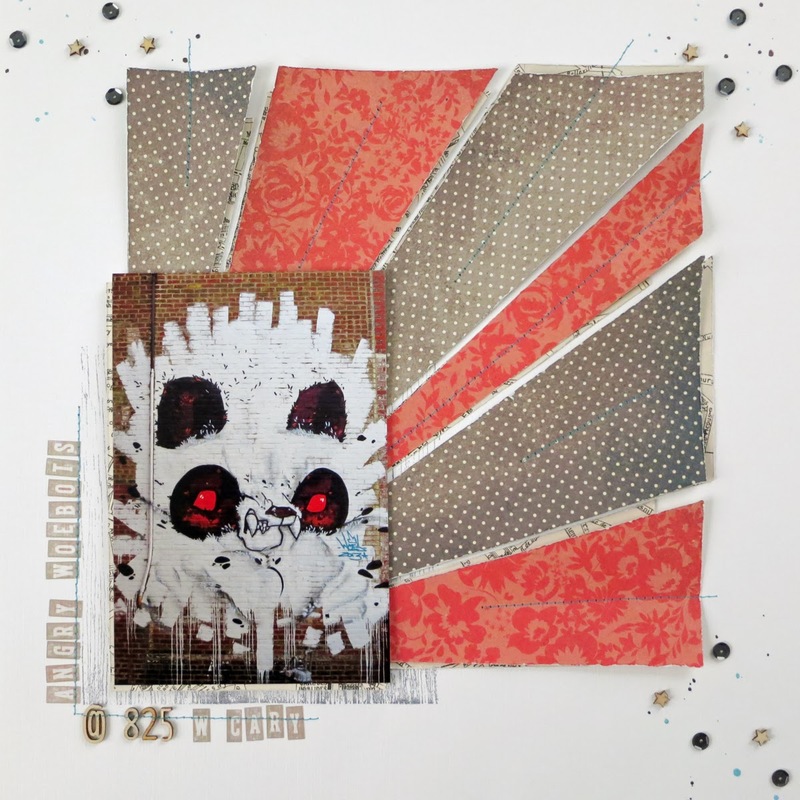 When I sat down to scrap, I had a color palette in mind based on the new mood board challenge at Life.Paper.Scrapbook. From their board, I was inspired by the bold mixture of colors as well as the sharp lines from one of the images. Their February sketch challenge was posted while I was working on this series and so I had to put it to use as well! I think it worked out well for this super fun mural, painted by Greg Mike. I'm still working on making a dent in my past Studio Calico kits, using papers from July and October. Gotta make room for some of the new lines coming out! I also wanted to finally get those cute fox badges from Freckled Fawn on a layout, and since the colors were spot on, I used them to represent the hubs and me. I added a bit of map paper as well as Heidi Swapp Color Shine, stitching, and wood veneer symbols and numbers to all three layouts to further connect them. Lastly, you may have realized there is no journaling, but that's because the details from the day were written on January's Project Life pages along with a photo of different Love sculpture. I'll be sharing those next week and I'm pretty excited with how it all came together. Hope you have a great weekend! Interesting art finds! Love the layouts! Wow, loving those photos, what a neat thing to capture despite running into a few snags. Makes me think about capturing all of our electrical boxes in the city. Each one is painted in a unique design. No idea why or who..but perhaps I should. Beautiful layouts! Love ALL of them :) Looks like a fun day trip! WOW elise, they´re tooootally stunning! love them! love the paper rays on the second one... have to lift you :D hugs my friend! What a cool outing! Wonderful pages to commemorate your discoveries. And such a cool "field trip"
Your pages are so fun so are your photos. 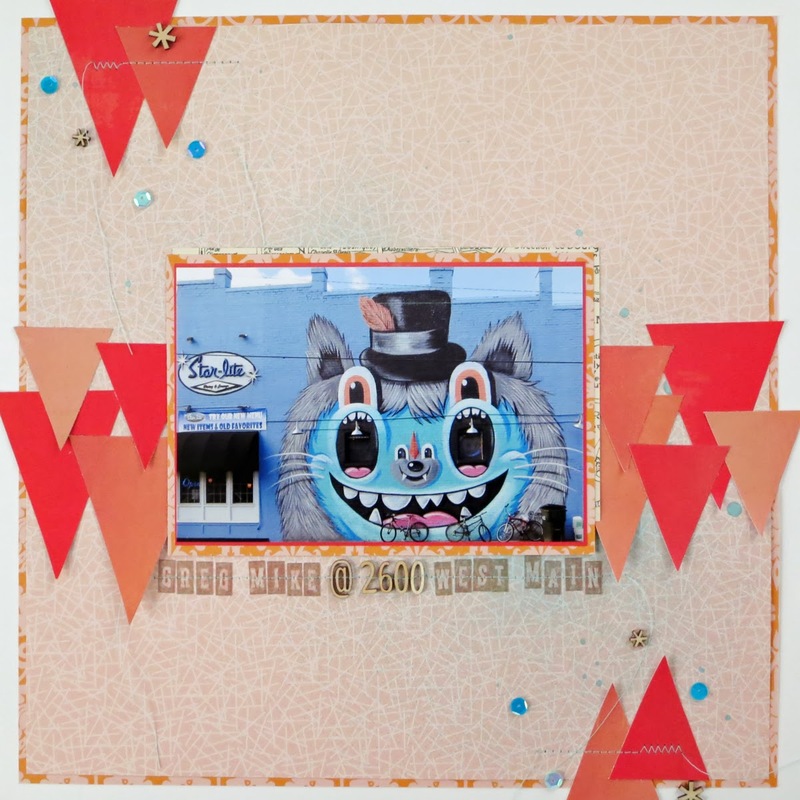 Amazing layouts - thanks for joining us at Life.Paper.Scrapbook! All of your layouts are great. I like that they all focus on the art, while being art themselves. So neat to be able to see this art in person. I didn't know about the "loveworks" had so many locations. I'm in Bristol (which is halfway in TN and VA - I live on the TN side) and the one on Downtown State Street in Bristol is so cool!! If you ever come see it, call me! ;) Awesome layouts - the triangles on the last one are perfect - they reiterate the animal's teeth! Beautiful take on the sketch and awesome work! Thank you so much for joining us at LPS! SUCH A BEAUTIFUL PAGE!!! !THANKS FOR PLAYING ALONG WITH US AT LPS!! !